Azure is responsible for taking care of database software, automatic backups, high availability, operating system & its hardware. User only need to take care of database itself. User need to pay according to service usage on hourly basis. They can make payment monthly or yearly but can’t forced to pay any amount upfront unless user itself want to pay. Based on usage demand, user can scale up/down or create/destroy the environment without the provider intervention. As we mentioned above in Point 1, Azure is responsible for the automatic backups. Full backup happens once a week, differential backups happens daily and transnational backup happens every 5 mins. Full backup started automatically after the database creation and after that other backups schedule automatically. This automatic backup service is free of cost. Point in time restoration is a self-service capabilities. It enable user to restore a basic, standard or premium database to any time within its service tier retention period. When we go for point in time database restoration, it always create a new database on the logical SQL Server. Automatic database backup service is free. But database restoration process is not free as it involve creation of new database. This new database is charge at normal database rates. Thus point in time database restoration is a very low-cost, simple and zero admin process which protect the database from accidental database corruption or accidental data deletion. 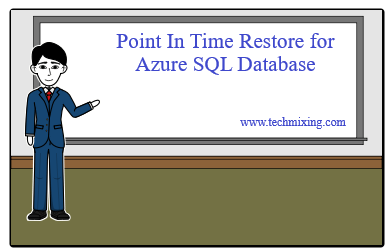 In this section, I will explain the step by step process of Point in Time database restoration in Azure. To explain this process, I will use the reference of the my azure SQL database “AzureDBRestoration” as shown in the below screenshot. To restore the database we need to click on the Restore link from the top Menu. It will bring up the Restore page for the selected database as shown in the below screenshot. Database restoration process always create a new database with a different name as shown in the above screenshot. Here default name for the new database as suggested by the Azure is “AzureDBRestoration_2019-01-07T17-13Z”. We can change it as per our requirement. In this case, I have changed the name to “AzureDBRestoration_Restore” as shown in the below screenshot. In the above screenshot, suggested time for Restoration point is 5:13:00 PM on 2019-01-07. Time mentioned in the screen is always in UTC. We can change this restoration time as per our need. Now suppose, we need to restore the database using the restore point time of 3 hrs back. So we will change the restore point time to 2019-01-07 2:13:00 PM (UTC) as shown in below screenshot. After changing the Restored database name and the restore point time, if required, we can also change the Elastic Pool and Pricing tier. Now click OK. It will start the restoration process which you can see under the notifications as shown in below screenshot. Once the database restoration process completed, you will got the success message as shown in below screenshot. You can also see the newly created Azure SQL database “AzureDBRestoration_Restore” in the database list by clicking on the SQL Databases link present at the left side as shown in below screenshot. 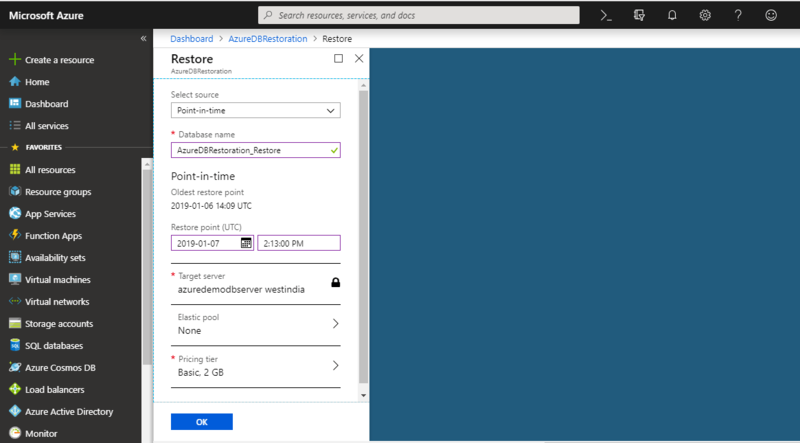 This article try to explain the automatic backups services provided by Azure, Backup retention periods and how to take the point in time database restoration. This database restoration process help in protecting the database from corruption and more importantly from accidental deletion of data.